2) Specify the path of ionic-timepicker.bundle.min.js in your index.html file. 4) You can configure this time picker at application level in the config method using the ionicTimePicker provider. Your config method may look like this if you wish to setup the configuration. But this is not mandatory step. In the above code i am not configuring all the properties, but you can configure as many properties as you can. The properties you can configure are as follows. a) inputTime(Optional) : This is the input epoch time which we can pass to the component. You can give any valid epoch time. Default value is (((new Date()).getHours() * 60 * 60) + ((new Date()).getMinutes() * 60)). b) format(Optional) : This takes two values 12 or 24. If we give 12 as the value, then it will be 12 format time picker or else if you give 24 as the value, then it will be 24 hour format time picker. Default value is 12.
c) step(Optional) : This is the value which will be used to increment/decrement the values of the minutes. You can give any value like 10/15/20/30. Default value is 15. 5) Inject ionicTimePicker in the controller, where you wish to use this component. Then using the below method you can call the timepicker. Apart from the config method, you can re configure all options in the controller also. If you again set any of the properties, they will be overridden by the values mentioned in the controller. This will be useful if there are multiple time pickers in the app, which has different properties. In all the above steps, only mandatory property is the callback where you will get the selected time value. Once you are successfully done with the above steps, you should be able to use this plugin. The first screen shot shows the popup and the second shows the modal of this plugin. You can use the below css class as the main class to customise popup. Directive name has been modified. If the minutes and hours are less than 10, then 0 will be prepended to the value of minutes/hours. Callback function added to get the selected time in to the controller. Class names modified as per this bug. Features added to customize this component. 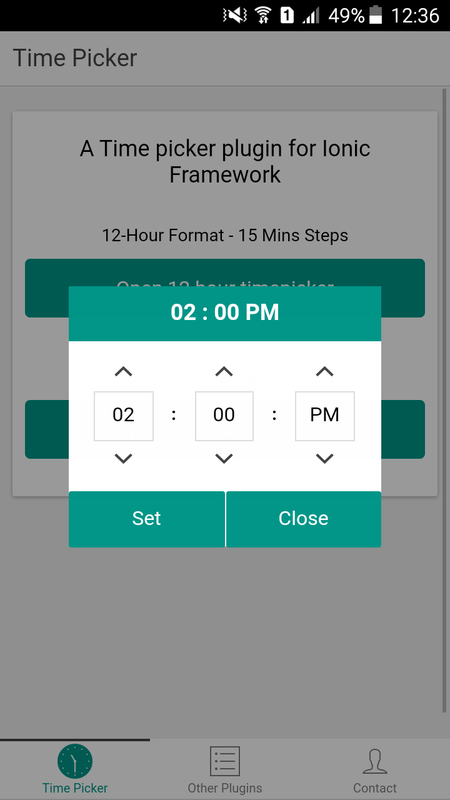 a) You can configure the ionic-timepicker from the config method. It is very good idea. but you could put dates momentjs? Excellent plugin! Thanks so much. FYI to anyone using this : Do not use the instructions here as they are out of date. Instead use the docs from Github. Thanks @Justin, I have updated the description here also. You can use the instructions mentioned here. Is there a way to change the color of the time picker? @Rajeshwar Hi, Can you point me how to set the Time popup is 00 : 00 : AM and the minutes displayed from 0 to 59 mins. Hi @KienGian, you can't set 00:00 AM. It will be 12:00AM. Because there will not be 00:00AM. And if you want to increase the time by a minute you can configure it using `step` property. can this be used with ionic 2 ? This is only for ionic v1.x. But the plan is also to support ionic v2.x, which will be release soon. Great plugin. Works very well across desktop/android/ios. Really nice one. I love the way it is an object you use and the callback to manage the value ! !